The Paris Agreement adopted by all 196 Parties to the UNFCCC at COP21 in 2015 establishes the framework for future climate action and the goals which will guide such action, but it is only the start. Parties must now come back and agree the rules, guidelines and processes needed to implement the Agreement. 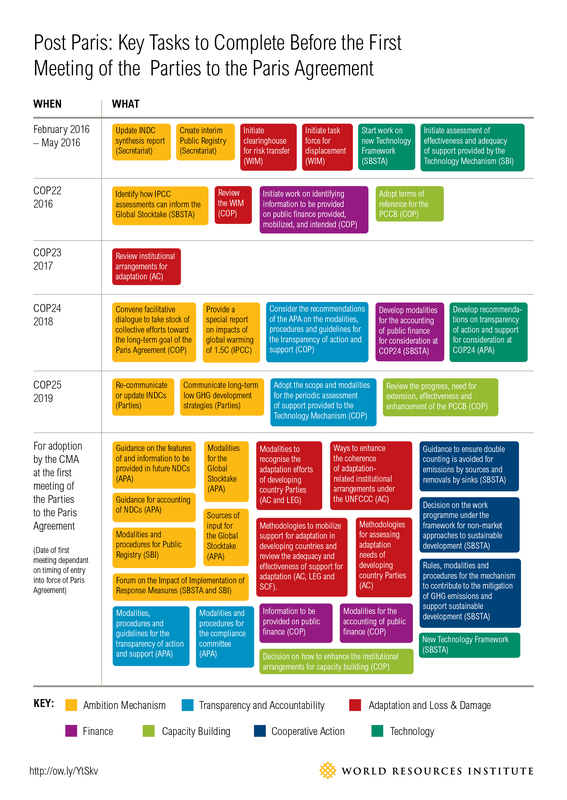 This graphic chronologically illustrates the specific tasks outlined by the Paris Agreement to be completed before the first meeting of the Parties to the Paris Agreement. The chart breaks the work down into seven key areas for action over the coming months and years: the ambition mechanism, transparency and accountability, adaptation and loss & damage, finance, capacity building, cooperative action, and technology. The color of each box reflects the work stream that the task falls under and the group responsible for completing each task is included in parentheses after each description.